CNN is reporting that Sony Pictures has acquired the rights to ALF, the NBC sitcom that ran during the late eighties. According to their report, the series star ALF, aka Gordon Shumway from Melmac, will be computer generated much like the Smurfs were in their movie last summer, and part of me can't help but think that the success of Ted is to blame. I, like everyone else, watched ALF when it was on. And I, unlike most normal people, own the series on DVD, including the post-series film Project: ALF, which I picked up for the princly sum of a dollar. But I have no confidence that this film will ever actually happen. Why? Two reasons: first, I refuse to believe that our cultural nostalgic obsession with the eighties has reached ALF level proportions. I mean, we haven't had a modern twist on The Facts of Life yet. They could make Jo a lesbian. Second, Paul Fusco, creator, puppeteer and voice of ALF, is basically insane. It has been well documented that the series was a death trap, riddled with trap doors to make room for the puppeteers. That his insistance on perfectionism, and insistance that ALF get all the best lines raised tensions on the set. Fusco has at various times refused to admit that ALF is a puppet, treating him as a real individual. Tina Fey has told a story of how the NBC 75th anniversary's biggest issue was dealing with Fusco, and his demands. Fusco has, over the years, attempted to bring ALF back in both TV and movies, and been shot down each time. Sony going this far is like playing along with a delusion, which any good doctor will tell is not what you are meant to do when someone is having a fit of this magnitude. 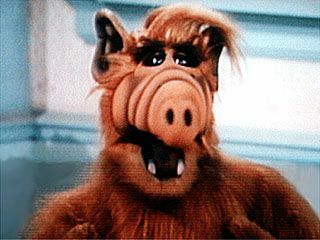 Or, maybe there really will be an ALF movie in the coming years, and we'll officially be over this whole 'the eighties were the best' thing we've been stuck on. We can move forward, and reboot Friends.